Stage micrometers are used to calibrate eyepiece reticles. Above is an image of a stage micrometer. You can learn more about measuring with a microscope and calibration here. One of the more popular stage micrometers is the KR-814 stage micrometer. This stage micrometer tends to be popular because it has a ruler of 1 inch and 25mm inscribed on it. Above are the actual lines as seen on the stage micrometer. For industries where inches and mm are used, this allows the user to purchase only one stage micrometer, rather than two. This is a breakout view of the measurements on the stage micrometer. 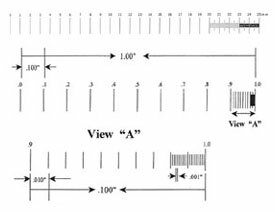 View "A" shows the distances between the lines on the far right of the ruler. You can view a variety of stage micrometers here.